I just realized how close we are to the end of the year. I was looking back at the drawings I made this year and came across this sketch I did back in January. I posted it on Flickr but never posted it here. I wonder why, since I like this sketch quite a bit. When I first finished it, I was just pleased that I had managed to make the hand look plausible. But over time, I really came to enjoy the expression that emerged here. I think it’s a little more wistful than the reference I used. This is 8″x8″ and sketched with an Ebony pencil. I think these are the best overall sketch pencils if you want to draw loose and let yourself go. It’s a nice fat pencil that feels good in your hand. You can get a good range of tone with just the one pencil. I used to buy them by the handfuls. Your portraits are getting finer and more soulful, though they already were so wonderful to begin with! This one is beautiful. This is a lovely portrait Mellanie. I love the way you manage to get great expressions with just the humble (or not so humble) pencil. 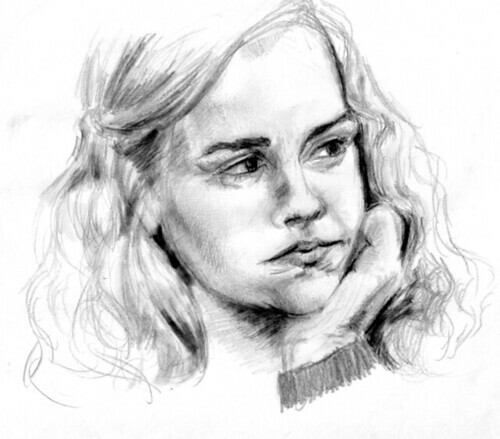 Definitely recognisable as Emma. So lovely! Glad that she found her way onto your blog for all of us to enjoy. I have an ebony pencil that I use to transfer designs to silk and never even considered using it for paper! Time to experiment! Thank you all so much. I think I would like to go back doing softer things like this. I have become a little too reliant on using sharp lines this year. I’m so glad you like this. Beautiful portrait….kudos, and LOVE your new wc leaf…well done. Thanks for stopping by Joanie. Glad you like the portrait.